February 1952: first stage appearance; he receives the name of Onoe Sakon I and plays at the Kabukiza the role of Tsuruchiyo in the drama "Meiboku Sendai Hagi". May 1965: shûmei at the Kabukiza for 3 young actors of the Otowaya guild; Onoe Ushinosuke V, Bandô Kamesaburô IV and Onoe Sakon I respectively take the names of Onoe Kikunosuke IV, Bandô Shinsui VIII, and Onoe Tatsunosuke I. The new Tatsunosuke plays the roles of Soga Gorô ("Kotobuki Soga no Taimen") and Matsu-no-Kimi ("Kimi-ga-Yo Shôchikubai"). February 1967: premiere at the Kabukiza of Hagiwara Yukio's dance-drama "Dattan"; Tatsunosuke plays the role of a rengyôshû [casting]. August 1967: tour in Montreal (Québec). September 1969: tour in the USA. 1975: Fujima Kan'emon IV (Onoe Shôroku II) takes the name of Fujima Kansai and Onoe Tatsunosuke I receives as a dance master the name of Fujima Kan'emon V.
January 1979: tour in the Popular Republic of China. March 1981: revival at the National Theatre of Kawatake Mokuami's drama "Jitsugetsusei Kyôwa Seidan"; Tatsunosuke plays the roles of the thief Akatsuki Hoshiemon and Wakisaka Awaji-no-Kami [casting]. June 1981: Tatsunosuke plays at the National Theatre the role of Danshichi Kurobê in the drama "Natsu Matsuri Naniwa Kagami". His stage partners are Ichikawa Ginnosuke I (Issun Tokubê), Sawamura Sôjûrô IX (Otatsu) and Kawarasaki Gonjûrô III (Tsuribune Sabu). January 1982: revival at the National Theatre of "Zôhiki", a bombastic play in the aragoto style which belongs to the Kabuki Jûhachiban; Tatsunosuke plays the role of Mita's brother Ryûômaru [casting]. January 1983: revival of "Nanatsu Men" at the National Theatre; Tatsunosuke plays the role of Gagoze Akaemon's disciple, in reality Mionoya Shirô Kunitoshi [casting]. January 1984: historic revival at the National Theatre of the play "Sankai Nagoya"; Tatsunosuke plays the role of Nagoya Sanzaburô [casting]. August 1984: second tour in the USA. January 1985: revival at the National Theatre of the drama "Kan U", which belongs to the Kabuki Jûhachiban; Tatsunosuke plays the role of Akushichibyôe Kagekiyo, later the Chinese general Chô Hi [casting]. Summer 1985: tour in the USA; Tatsunosuke plays the roles of the priest Shinsai, the thief and Hirai Yasumasa in "Shibaraku", "Tachi Nusubito" and "Tsuchi Gumo", which celebrate the shûmei in the USA of Ichikawa Danjûrô XII [more details]. February 1986: Tatsunosuke suddenly falls ill and has to rest for a while. November 1986: Tatsunosuke is back on stage, playing at the National Theatre the role of Sadakurô in the drama "Kanadehon Chûshingura". 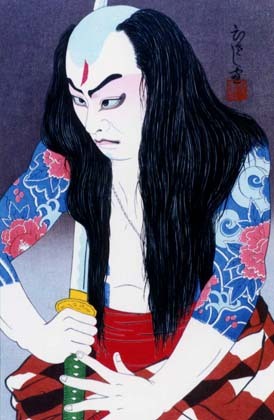 January 1987: Tatsunosuke appears on stage for the last time, playing the role of Kumedera Danjô in the drama "Kenuki", which is staged at the National Theatre. 28 March 1987: Tatsunosuke dies in Tôkyô. Onoe Tatsunosuke I was a promising tachiyaku actor, who could have been the worthy heir of his father Onoe Shôroku II but he was unfortunately cut down too early. His most notable performances include Benkei ("Kanjinchô"), Ranpei ("Ranpei Monogurui"), Kumedera Danjô ("Kenuki"), Umeômaru ("Kurumabiki") and Soga Gorô ("Soga no Taimen"). He posthumously received the name of Onoe Shôroku III in 2002.